Below the waterline, the leaves of the water milfoils are divided into threadlike segments and look almost like feathers. Above the water, they are bladelike with toothed edges. The rooted stems may be several feet long. Flowers are small, purplish, and arise near the tips of stems that emerge above the waterline. 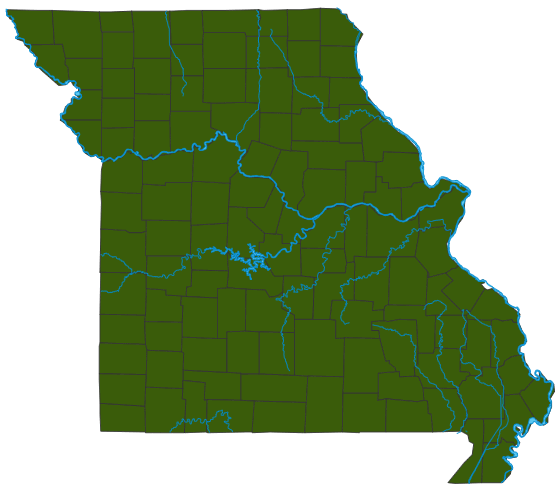 Missouri has three native species of water milfoil and two that are introduced. Stem length: to 6 feet. Milfoils occur in calm, shallow waters of streams, ponds, and lakes. The introduced species, especially Eurasian milfoil (M. spicatum), can grow rampantly, crowding out other plants and causing serious problems in Missouri ponds and lakes. People have spread milfoils globally, and in many places they have become invasive plants demanding efforts—and money—to keep waterways clear of them. Milfoils, sometimes under the name of parrot’s feather, are sometimes sold in pet stores as an aquatic plant for aquariums. Like other aquatic plants, milfoils provide shelter for innumerable aquatic animals, from tiny daphnia to larger fish, and all the food-chain links in between. When milfoils grow too abundantly, it is often a result of excessive nutrients (fertilizer, farm runoff, etc.) entering the water.